2012 Lotus Evora review | What Car? What is it? The 2012 Lotus Evora. Not only does it answer some of the most major criticisms of the car, it also shows the direction Lotus cars will take in the future. The company has ambitious plans to produce far more expensive cars, and the improvements to the Evora are the first steps towards being able to give the customers the quality they expect. In the Evora, Lotus has worked particularly hard to raise the perception of quality inside, and the lessons it learns here will benefit buyers of the Esprit, Elan and Elite in the future. What's it like to drive? There are only minimal mechanical changes, so the Evora remains superb to drive, with a simple chassis and beautifully balanced suspension. However, the few minor revisions are effective. First, the new exhaust system gives the car a far more sporty sound; secondly, revisions to the flywheel and engine mounts make the engine more responsive; and, thirdly, the gearchange is much better. Admittedly, it's still far from perfect, but it now requires less man-handling to get from one gear to another, while the simple measure of replacing the rounded gearlever top with one more moulded to the shape of the hand makes it far easier to use. What's it like inside? Lotus' revisions are noticeable from the moment you open the door. However, the beauty of it is that, although most of the changes are pretty minor, they add up to a big improvement. There's no better example of this than the interior door pull. In the 2011 car, it was a single piece of plastic attached rather crudely to the door; and, although it's the same piece in the 2012 car, it's attached more solidly, wrapped in leather and with a piece of foam between that and the plastic underneath. It immediately gives the cabin a feel more worthy of car as expensive as this. All around, there are plenty of similarly effective quick fixes: a new door locking mechanism means there are no interior pop-up lock indicators on the doors; kick plates gleam in the door sills; the new steering wheel feels much nicer to hold; the leather on the seats is of better quality, with smarter stitching; and all the leather trim has foam underneath to give a soft-touch feel. The result is that the faint whiff of kit-car in the cabin has gone quite literally, in fact, because another revision was to use a less odorous glue. Admittedly, the quality here still won't be giving any Audi or Mercedes engineers sleepless nights, but the car is now more worthy of comparison with such exalted company. Sadly, though, there are some things that Lotus couldn't change. So, the poor ergonomics and largely unreadable dials remain, as does the dreadful rear visibility. However, the company is already talking of the revisions to feature on the 2013 car, and has hinted that some of these will be addressed in 12 months. Should I buy one? 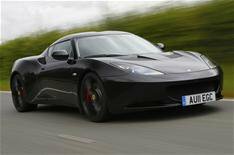 We already loved the Evora it was Highly Recommended in the Performance Car class of this year's Car of the Year awards and these revisions only improve it without adding much to the cost, so it remains one of our favourite cars. Trouble is, we know that, in a year's time, we'll see another series of revisions and, given how much the company has achieved in the four months these changes took to implement, imagine what they could manage in 12.